SIGNATURE™ SYSTEM: THE SOLUTION THAT'S JUST FOR YOU. If you think the Oxford® Partial Knee sounds good, wait until you hear this. 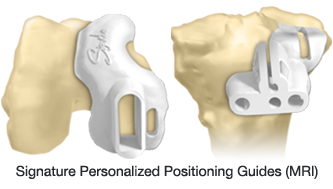 Every Oxford knee is now available with an added bonus: personalized implant positioning. We call it the Signature** system, and it's the knee replacement technique that's based on your specific anatomy. Using MRI technology and patient-matched guides, the system helps surgeons plan for the alignment of your Oxford Partial Knee. It's the personalized approach that's just for you, from Zimmer Biomet. Instead of relying on two-dimensional x-rays to plan your surgery, the Signature™ system uses an MRI of your knee in conjunction with computer software to create a 3-D image of your unique knee joint. The MRI is also used to create custom femoral (thighbone) and tibial (shinbone) positioning guides that fit directly onto your unique anatomy. With the combination of the MRI and Signature™ positioning guides, your surgeon has access to a greater level of detail and precision for implant positioning and alignment before the procedure. The result? Patient-specific positioning of your knee implant. WHAT MAKES SIGNATURE SURGERY SO UNIQUE? With the Signature system for the Oxford Partial Knee, your preoperative experience will be similar to most total knee patients, with one exception. An MRI of your affected leg will be required. A typical MRI scan lasts about 20 minutes. The scan will be performed only on your hip, knee and ankle, so your head will remain outside the machine. The MRI is used for preoperative planning by your surgeon and for the design and manufacture of the Signature™ personalized positioning guides that will be used during your partial knee replacement. During surgery, there are significant differences between traditional and Signature knee replacement techniques. Traditional Knee Replacement - During traditional knee replacement, metal instruments are used to remove the damaged bone and cartilage, confirm implant sizing, and establish proper implant positioning and alignment on the bone. Additionally, instruments are sometimes placed inside the femur (thighbone) and/or tibia (shinbone) to assist with implant alignment and positioning. Signature Knee Replacement - With the Signature system, custom guides are placed directly onto your unique anatomy to assist the surgeon with implant alignment and positioning. These personalized guides are created from the 3-D MRI of your knee. **A collaborative partnership with Materialise, N.V.